20 x Single robe hooks. Sturdy material: the single hook is made of zinc alloy and the screw is made of iron, hard and durable material, not easy to break and can resist rust and erosion. Quantity: 20 pieces of hooks and 50 pieces of screws. 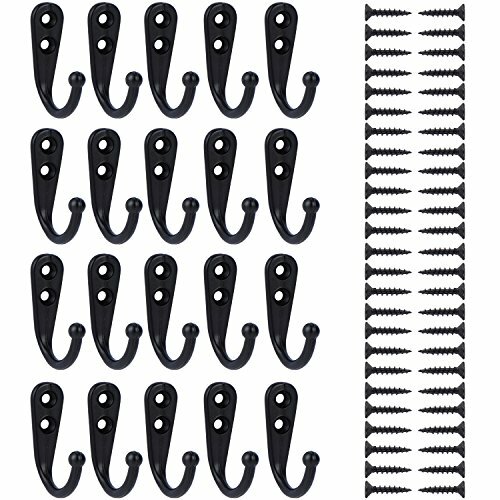 eBoot 20 pieces wall mounted hook robe hooks single coat hanger and 50 pieces screws, black Multiple applications: You can use these hooks in different places, such as bedrooms, bathrooms, entryway and closets, to hang various items, such as dresses, clothes, towels and hats. Easy to install: Each hook has 2 holes, can be reinforced with two screws, the hooks and the screws match each other well, recommending mounting to solid wood or wooden studs. Specifications: Color: black Hook dimensions: 44 x 30 mm/ 1.73 x 1.18 inches Screw length: 15 mm Material: zinc alloy and iron Quantity: 20 pieces of hooks and 50 pieces of screws Package includes: 20 x Single robe hooks 50 x Screws Note: Small parts, please keep away from children.